I just got this great koozie from CoolerTorch. It is just like a traditional koozie. It keeps your drink nice and cold while you enjoy it. Made of a great insulated material to keep the cold in. Has a fun design on it with fun vibrant colors. This one is unique because it has a light in the bottom of it. So it lights up your beer or other drink while you are drinking it. Makes them lots of fun and interesting. I also like this because on fall night around the camp fire it makes finding your drink a lot easier! Very fun little Koozies! Very well made. The BLACK Koozie Cooler MALE designed LED Flashlight for Outdoors Fishing Camping Hiking Sports Parties and Events. Planning a party or an event? Do you have a loved ones Birthday party coming up soon? Do you need to create a special gifts bag or are you planning for your coming Christmas celebrations? 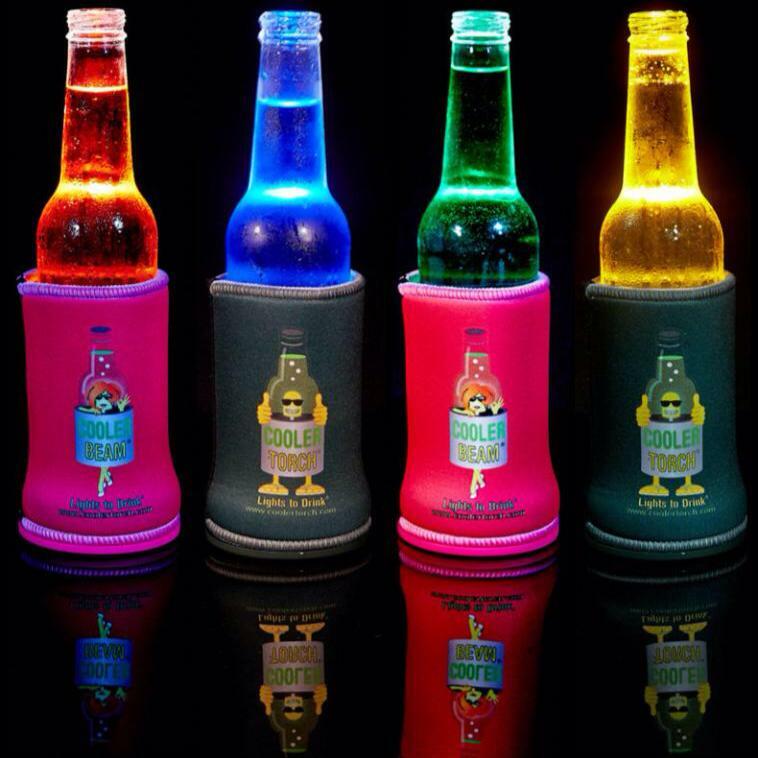 The Koozie LED Flashlight can illuminate your celebrations to create a lot of fun in these events. Over 19 Powerful Colored (White, Green, Red Beam) LED Lights – The Beverage Drinks Light is of the highest quality and can keep your beverages cool and illuminated: Never Loose a drink in the dark again! Very useful for Outdoors, Fishing, Camping, Hiking, Sports Parties and Events, to keep Dads Beer Bottles, Mums Wine Glass, Water Bottles, Sports Drinks and even the Babies Milk Bottle Cooler for enjoyable drinking. Not to mention FUN! Simply click – ADD TO CART – to buy today or – ADD TO WISH LIST – to be reminded later! Remember if you love our product; as so many people do: please do tell us below in a review!! Great for gifts, Party Baskets and Give a Ways. Included Batteries and unique draw string bag! The Drink Illuminator. See your beverages in the dark.. with it’s purpose made beautiful draw string bag. If you love our product; as so many people: please do tell us below!! The Koozie LED Cooler offers a great gift opportunity to give this rare special gift to those who seem to have everything..Some of our Amazon reviews show kids and toddlers looking so proud with their milk bottles shining like the moon! Kids love the Lighted Koozie!